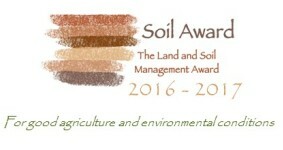 (28 November 2016) – The European Landowners’ Organization (ELO) has launched the 2016-2017 edition of its Land and Soil Management Award. Sustainable land and soil management is central to improve our food systems, maintain a healthy environment and ensure European rural development. Indeed, soils, through their structure and the great variety of species they host, perform numerous functions including food production, nutrient and water storage, filtering, buffering as well as breaking down and conserving organic matter. They also play a central role in the protection of water and in the natural exchange of gases with the atmosphere. Moreover, soils are biological habitats, gene pools, elements of landscapes and of cultural heritage as well as providers of raw materials. The prize rewards land use and soil management practices mitigating soil threats i.e. soil degradation, erosion, reduction of organic matter content, diffuse contamination, and compaction as well as the reduction of soil biodiversity, salinization, sealing, flooding and landslides. Deadline for application is 31 December 2016.